The Segments list view is a table that displays the segment names, their creation date and time, their creator and the total number of contacts for each available segment. The Clone icon, positioned to the right of each row in the table, enables a copy of a segment to be made and edited as required. See Cloning a segment for more details. The default list view displays the oldest segments first. To sort the list, for example, by the creation date and time, click the double-headed arrow, positioned to the right of the appropriate column. 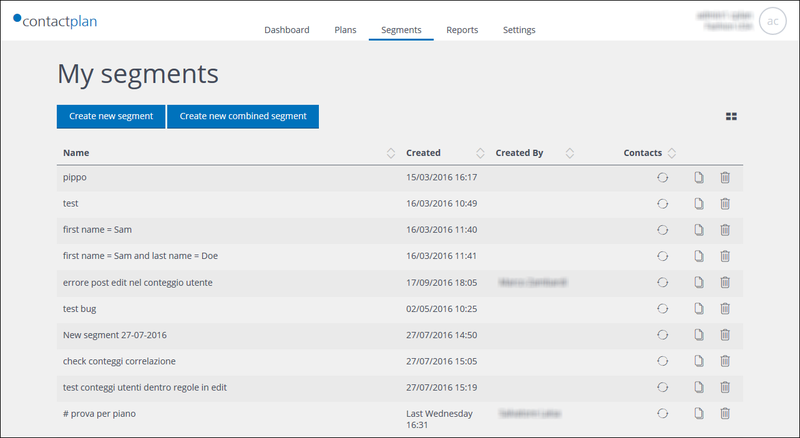 If you navigate away from the Segments tab and then return, the default list view is displayed again. The total number of contacts that are available by applying the rules for a particular segment, varies over time. Click the appropriate circular Reload icon, positioned in the Total contacts column. The current total displays after a short delay, while the system applies the rules to the relevant database.